What is your skin trying to tell you? Much like a scale is used to monitor weight, the gpskin Barrier is a device that monitors overall skin health. The gpskin Barrier is built with four sensors of the most advanced skin sensor technology, only previously used in research labs and hospitals. The Barrier simultaneously scans the Trans-Epidermic Water Loss (TEWL) and Stratum Corneum Hydration (SCH) levels of your skin. The TEWL sensor measures how much water your skin loses, an important factor in skin health. 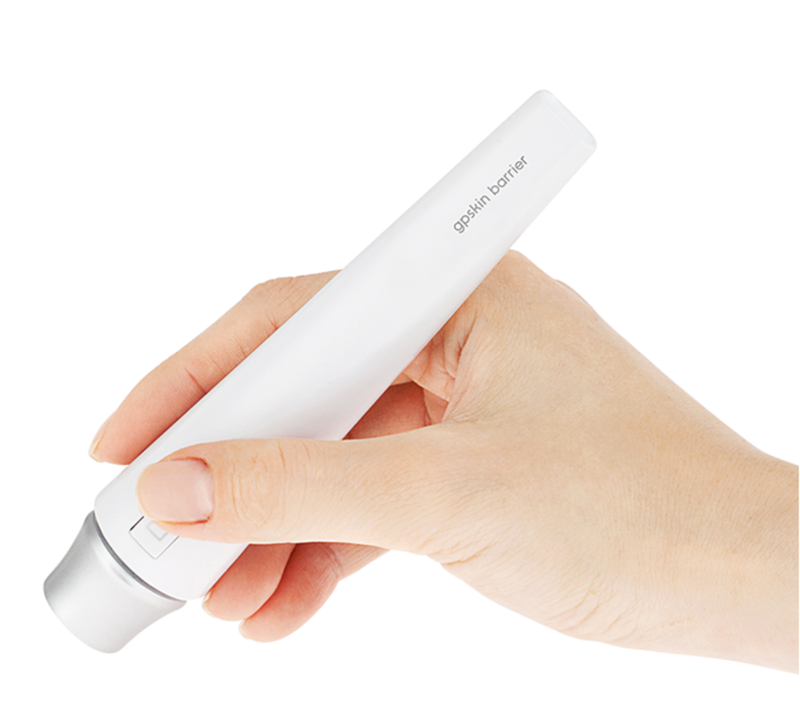 The SCH sensor measures how much moisture your skin is holding. In a matter of seconds, the reading is sent over bluetooth to your phone via the gpskin App. The Barrier Function is an extremely important concept in skin care. It describes the strength of the skin barrier and how well it protects skin from the external environment. The barrier function refers to the Stratum Corneum layer of skin (outermost layer of the epidermis). It is analogous to a brick wall, a concept coined by Dr. Peter M. Elias of the University of California, San Francisco, who is an expert on skin barrier and epidermal biology. The amount of moisture your skin holds is an key factor to your overall skin health. The more moisture your skin contains, the healthier your skin is. Low moisture levels means your skin is dry. Without sufficient moisture, your skin can be vulnerable to a weakened skin barrier. For every body part you scan, we deliver a detailed analysis of the skin and offer solutions based on your results. Because your skin health varies throughout your body, it’s important to know how to manage each body part for optimum skin care. Using the latest bluetooth technology, our device connects to your smart phone for your convenience. The Barrier wirelessly sends your skin results directly to your phone to be viewed. Manage your skin from wherever you are.